Seville has its origin in the ancient Ispal; all investigations points towards the fact that Seville was situated upon an elevated area next to the Guadalquivir river in the VIIth century B.C. The tartessian town, Ispal, developed by active trade with greek, phoenician and carthaginian navigators who arrived at the city of ispal through the Guadalquivir river from the mouth of the Sanlúcar de Barrameda river in search of gold and other materials. The tartessian culture invented bronze, perfected its sea navigation and created the first political state in the west. 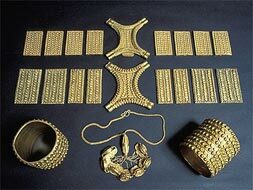 Thanks to its silver and gold mines and to its trade with the phoenicians, the town of Tartessos reached a great degree of wealth and developement admired by greek historians. The victory of Aphasia in Corsica in 535 B.C. of the Punic-Etruscans against the Greek focenses, ends tartessos trade with the greek focenses who succeeded the phoenicians in its relations with the tartessos; this initiates its decline. In the year 500 B.C. the tartessian culture finally disappears, the turdetanos could have continued its inheritance. A possible explanation of the disappearance of tartessos therefore resides in the decline of the phoenicians in its dominance of the Mediterranean and the power of the punic-etruscan alliance against the greek focios; this catapults the expansion of the punics, who invade tartessos and destroy their capital, yet another maneuver to dominate Mediterranean trade. However, whether the collapse derived from the carthaginian attacks or if it was a product of the economic decline of its commercial activity, this for the moment cannot be solved. As a result of the first Punic war, by 241 a.C the Carthaginians lose control of their main positions in the Mediterranean and Turdetania (the Andalusia of the time) after undergoing by than two centuries of the Carthaginian yoke, finally revolts. In 237 A.D. Almicar Barca disembarks in Cadiz to choke the revolt and defeats the insurgents supported by celtiberian mercenary forces. In the year 216 A.D. however, some uprisings and revolts of the turdetano towns occur. In 206-205 A.D. the Romans expelled the Carthaginians, in the Second Punic War and after the battle of Ilipa, and declares the city theirs and call it Hisplais, of the province of Bética. After conquering Cartagena in 209 A.D. and depriving Carthage of the main port used to mantain their war effort in Italy, Publio Escipión enters the Guadalquivir river downstream, putting down the Carthaginian strongholds, supported by the natives who were also against the roman advance. Cástulo, Baecula, Ilipa, and Carmo all fall to the advance of Publio Escipión, who founds near Seville the first roman colony of Spain, Italica. It is a prosperous period for the city; it expands considerably and it is built upon remarkedly, (circus, spas, theater, aqueduct, etc.). And even more, the process of development and wealth of Hispalis is accentuated after the victory of Caesar over Pompeyo in the Civil War. Towards the first century A.D. Hispalis is equipped with a wall and obtains the title of Colony Iulia Romula Hispalis (Iulia by its own name; Romula from Rome; and Hispalis because it was built on posts dug in the ground). Hispalis, on the banks of the Guadalquivir river, was considered the commercial and industrial capital of Roman –Spain. Itálica, a few kilometers from Hispalis, founded by Escipión in 206 A.D., was the purely Roman residential city. At present, of all of the constructions of Hispalis, there only remains some columns in the Calle Marmoles, the ruins of a temple, and the arches of the aqueduct on the Calle Luis Montoto.